I’d like to take a minute to explain the different attendance options that are available in My Music Staff. Student attendance is an important part of your studio for a few reasons. The core to customer satisfaction is good communication. Your students (and their families) are your customers, so communicating your attendance policy clearly and keeping accurate attendance is paramount to a successful music teaching business. When you use My Music Staff to schedule your student lessons, it will automatically ask you to enter the attendance for any lessons that have passed. There are a few different attendance options available. It might seem a little overwhelming at first, but once you get the hang of it we think you’ll really like using it. Unrecorded – This is the default attendance setting, and it means that My Music Staff doesn’t know if this student showed up or not. 99% of the time you’ll be changing the attendance status from Unrecorded to something else. Present, Make Up – Choose this option if the student was present and you want to use a make-up credit (rather than bill the student). This option will NOT be shown if the student doesn’t have any make-up credits. Absent, Make-Up ($) – Choose this option if the student did not attend the lesson, but you’d like to issue a make-up credit. Just like with “Present ($)”, the “($)” means that the student will be billed for this lesson. Absent, No Make-Up ($) – Choose this option if the student did not attend and you won’t be making up the lesson. The student will be billed for this missed lesson. Most teachers use this option if the student was a no-show. 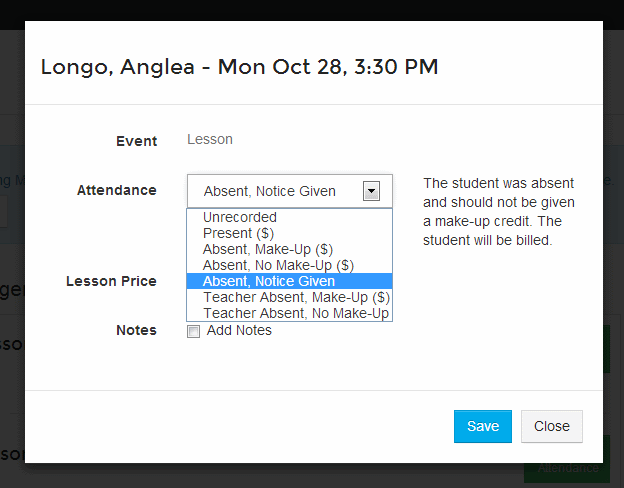 Absent, Notice Given – Choose this option if the student was not present but gave you advance notice. For example, if the student let you know a few days before the lesson you would use this option. No billing charge is assigned to the student (and no make-up credit is issued). Teacher Absent, Make-Up ($) – Choose this option if you were absent and wish to make-up the lesson. The student will be billed, and a make-up credit will be issued. Teacher Absent, No Make-Up – Choose this option if you were absent and do not wish to make up the lesson. The student will not be billed. Make-up credits are a great way to ensure that your monthly income remains relatively constant, but also that your students get what they’re owed. You’re the teacher, so you get to use your discretion on when to issue a make-up credit and when not to. You can view and adjust the number of make-up credits each student has in their student details page. My Music Staff makes managing this easy and transparent. You’ll never lose track again, and most importantly, you’ll earn trust from the customers that you serve.